248 people want to go here. 294 people have been here. Austria (literally "the Eastern Realm" or "Eastern Empire") is a land-locked alpine German speaking country in Central Europe bordering Switzerland and Liechtenstein to the west, Germany and Czech Republic to the north, Slovakia and Hungary to the east and Slovenia and Italy to the south. Austria, along with neighboring Switzerland, is the winter sports capital of Europe. However, it is just as popular for summer tourists who visit its historic cities and villages and hike in the magnificent scenery of the Alps. Vienna is the capital of the Republic of Austria and one of the nine states of Austria. Vienna is Austria's primary city, with a population of about 1.7 million (2.3 million within the metropolitan area, more than 25% of Austria's population), and is by far the largest city in Austria, as well as its cultural, economic, and political centre. It is the 10th largest city by population in the European Union. Salzburg is the fourth-largest city in Austria and the capital of the federal state of Salzburg. Salzburg's "Old Town" (Altstadt) with its world famous baroque architecture is one of the best-preserved city centres north of the Alps, and was listed as a UNESCO World Heritage Site in 1997. The city is noted for its Alpine setting. Salzburg was the birthplace of 18th-century composer Wolfgang Amadeus Mozart. The Eisriesenwelt (German for "World of the Ice Giants") is a natural limestone ice cave located in Werfen, Austria, about 40 km south of Salzburg. The cave is inside the Hochkogel mountain in the Tennengebirge section of the Alps. It is the largest ice cave in the world, extending more than 42km and visited by about 200,000 tourists every year. A Christmas market, also known as Christkindlmarkt, Christkindlesmarkt, Christkindlmarket, and Weihnachtsmarkt, is a street market associated with the celebration of Christmas during the four weeks of Advent. These markets originated in Germany, Austria, South Tyrol and Alsace but are now being held in many other countries. Hallstatt, Upper Austria is a village in the Salzkammergut, a region in Austria. It is located near the Hallstätter See (a lake). At the 2001 census it had 946 inhabitants. Alexander Scheutz has been mayor of Hallstatt since 2009. St. Stephen's Cathedral is the mother church of the Archdiocese of Vienna and the seat of the Archbishop of Vienna, Christoph Cardinal Schönborn, OP. Its current Romanesque and Gothic form seen today, situated at the heart of Vienna, Austria in the Stephansplatz, was largely initiated by Rudolf IV and stands on the ruins of two earlier churches, the first being a parish church consecrated in 1147. 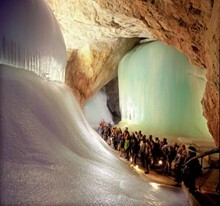 Visit the largest Ice caves on the planet and discover the magical sights offered with the district of Salzburg. A masterpiece of ice and rock awaits you! Located between Salzburg and Graz, in the Salzkammergut Lake District of Austria, Hallstatt is a little town of breathtaking views. 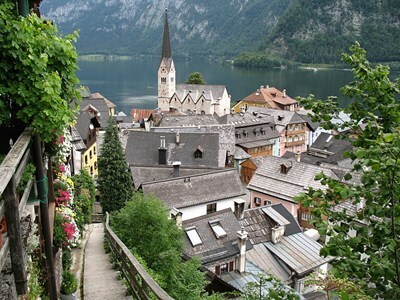 Considered to be the oldest still inhabited settlement in Europe, Hallstatt is a UNESCO heritage site and an important Austrian tourist attraction."